That's right! 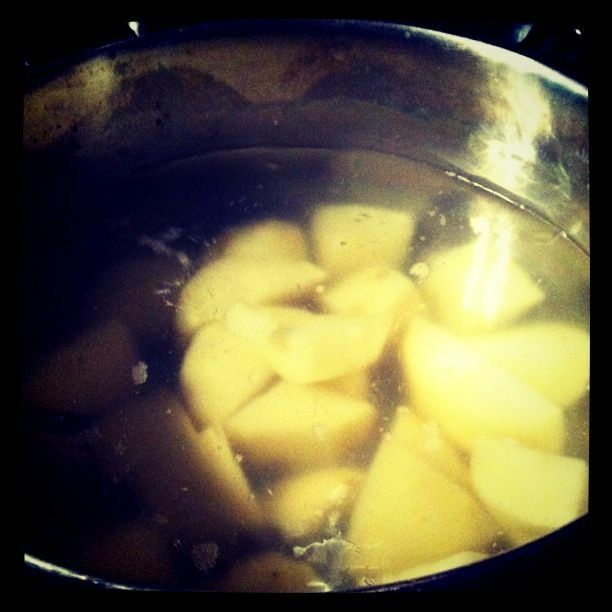 It's cold outside and I have too many potatoes... time to make soup! I woke up to an e-mail this morning asking if I had a fabulous Potato Soup recipe, and sure enough, I DO! So Kacey, here you go, friend! Enjoy and let me know how yours turns out! Now, this recipe might be slightly annoying for those of you who don't have a Vitamix or a food processor but using an electric mixer will work just fine. For those of you that DO have a Vitamix, rock on and we'll do the secret handshake later. ;) But really, it'll make you fall even MORE in love with your Vitamix if you haven't made soup in it yet.. just wait! Heavy Cream, Half & Half or Whole Milk... you could use skim but your soup will just be watery and totally lifelessly unexciting. just deal with the calorie thing in your mind, really.. get over it for the sake of great soup. White Cheddar Cheese... Cabot or Cracker Barrel are winners, they melt so beautifully. Celery Stalks, leafy bits included! Chicken Bouillon Cubes... not too many though, butter and white cheddar are salty already. Here we go... Start boiling water for your potatoes. While that's getting hot, peel and chop your potatoes. 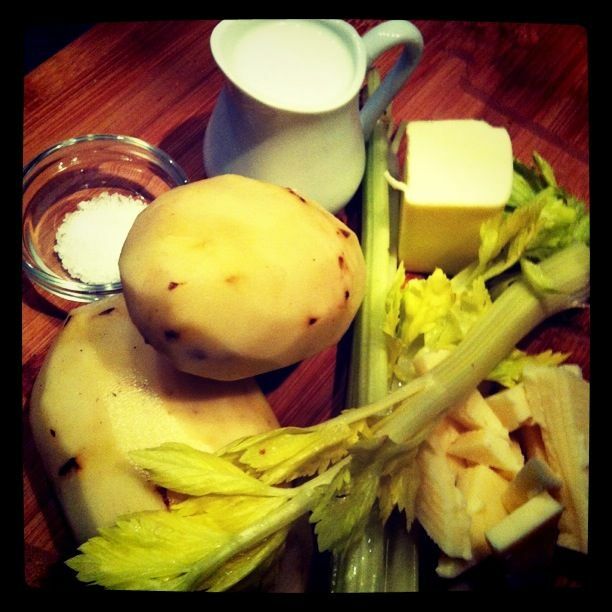 Chop your cheese, butter and celery... (for those of you not using a food processor, finely chop your celery.. the smaller the pieces, the softer they'll get when you cook them and then they'll be easier to blend with your mixer) Throw the potatoes in the boiling water and let them boil until they're soft. While these are boiling, let's make the basil oil. Puree the basil leaves and the oil in your Vitamix or blender until smooth. Simmer it in a small saucepan for 5-10 minutes, and stir it often so it doesn't burn anywhere. Then pour through a fine mesh strainer into a pretty little bowl. Basil oil done! 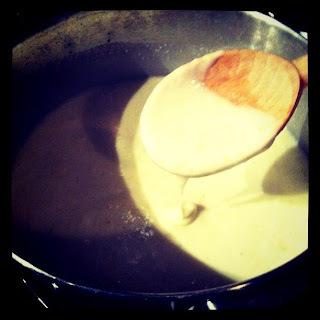 In another pot, stir the butter, cheese, cream, garlic and chicken bouillon cubes until it's all nice, thick and blended. (if you're not using a Vitamix, add your celery pieces here as well and cook a bit longer until the celery starts to get soft) Add in your sea salt and pepper to taste. Now your potatoes should be getting soft! Drain your potatoes and put them into your Vitamix! No need to let them get cool. Take your creamy mixture and pour it right into the Vitamix with the potatoes and add your celery! Blend away! I like mine smooth so I put it on the 'high' setting at about 2 or 3. Remember, your potatoes should still be piping hot from cooking and the Vitamix is whipping that stuff around so fast it's only adding to the heat, so don't worry about keeping that pot warm for reheating. You'll be able to serve it hot right out of the Vitamix. If you're not using a Vitamix, place the softened potatoes in the creamy mixture and start to mash the potatoes with a wooden spoon. Then get our your electric mixer and mix mix mix away... You should be able to get it to a smooth texture no problem now that your celery has had some time to cook. But don't worry if you still see a few chunks of whole celery in there, texture is good too! Now taste it and make sure it's seasoned enough for you... add salt and pepper accordingly then dish it out! Before serving, take a little spoon to your freshly made basil oil and drizzle it right in the center of each cup or bowl of soup. (notice i said a little spoon.. this stuff is potent so use it sparingly) If you must, top it with a little dollop of sour cream first, then the oil. :) And then pepper it for looks... really it makes it so much prettier. 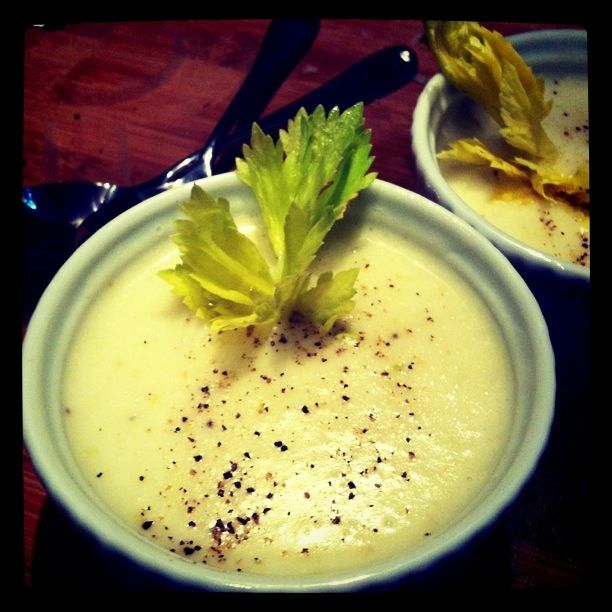 Garnish the side with the pretty, leafy tops of a celery stalk and you're done! Not the most impressive of recipes today but it's a keeper! It's a good staple to have right? :) Cozy up tonight, turn on a good flick or break out that book you've been meaning to read and enjoy this delicious potato soup. You'll have a nice big smile on your face after every bite. Keep the photos and questions coming, you guys! I LOVE getting them!